New material on tableting scale-up and compaction. Regulatory appendices that cover FDA and EU Guidelines. New chapters on risk evaluation and validation as related to scale-up. Practical advice on scale-up solutions from world renowned experts in the field. 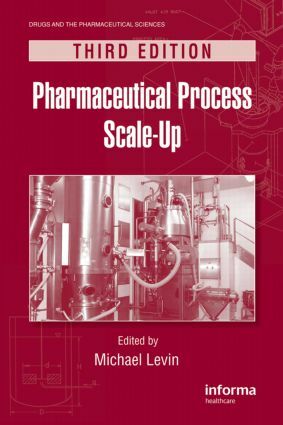 Pharmaceutical Process Scale-Up, Third Edition will provide an excellent insight in to the practical aspects of the process scale-up and will be an invaluable source of information on batch enlargement techniques for formulators, process engineers, validation specialists and quality assurance personnel, as well as production managers. It will also provide interesting reading material for anyone involved in Process Analytical Technology (PAT), technology transfer and product globalization. "…the text include[s] comprehensive coverage of many of the significant aspects of pharmaceutical scale-up, realistic case studies for nearly each process, and extensive reference lists"